Hey, I think u should add the link for the original pictures u used to make this wallpapers. thats kinda important here. oh, i going to do this now... ah, capcom release gameplay with vergil, search in youtube. Btw, what program did u use? Photoshop? Gimp? I like the composition. It uses a cool perspective, looks great and dynamic but the result is not so satisfying overall. You arranged the elements nicely, and the guys really fit the background but I'm afraid you used too many filters on the cathedral. 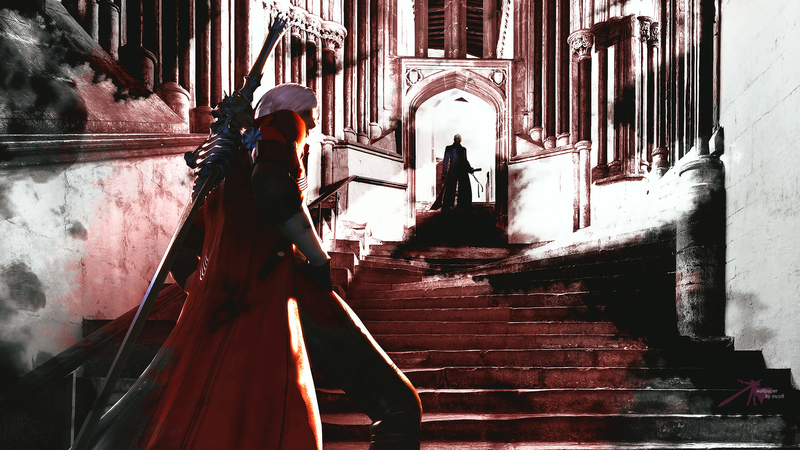 The environment should be much darker and considering the lights on Dante, there should only be bright light coming in through that door, which Vergil is blocking. It is better than your first wall but there still are things to improve, especially about the BG. Keep it up, though, I think you can get better! Quote by elisadevelonI like the composition. It uses a cool perspective, looks great and dynamic but the result is not so satisfying overall. You arranged the elements nicely, and the guys really fit the background but I'm afraid you used too many filters on the cathedral. The environment should be much darker and considering the lights on Dante, there should only be bright light coming in through that door, which Vergil is blocking. Yess, putting the signature on the wallpaper is one of the rules here. So u should. I like the almost graphic-novel edge it has to it. You did a nice job extending out beyond the original cathedral photograph, and I really like the overall composition.